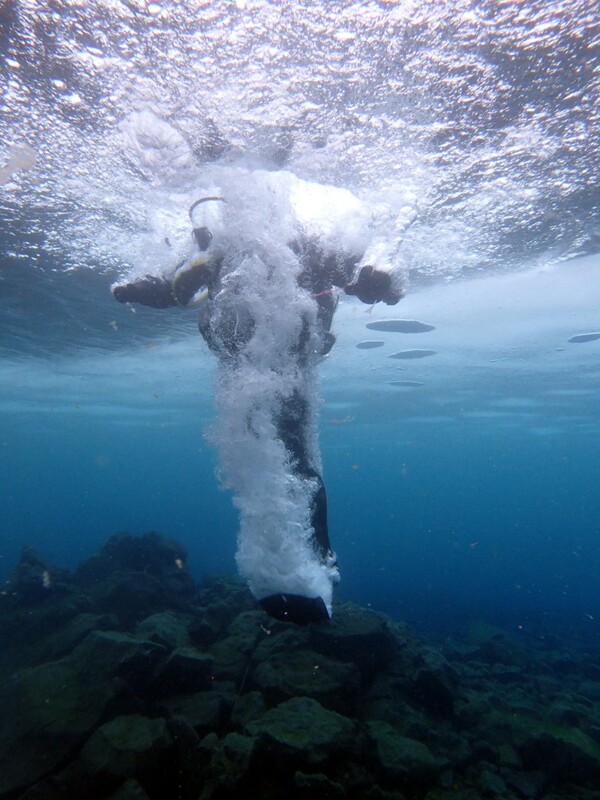 Davidsgjá, the fissure of David is one of my favorite dive sites in Iceland. 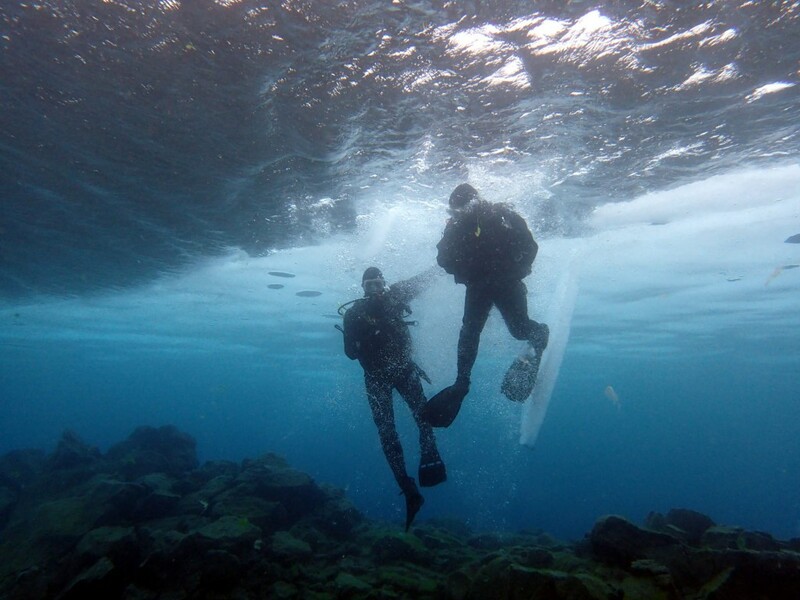 In Þingvallavatn, Iceland’s largest natural lake, the rift extends over several hundred meters and leads the divers to a depth of 15-20m. 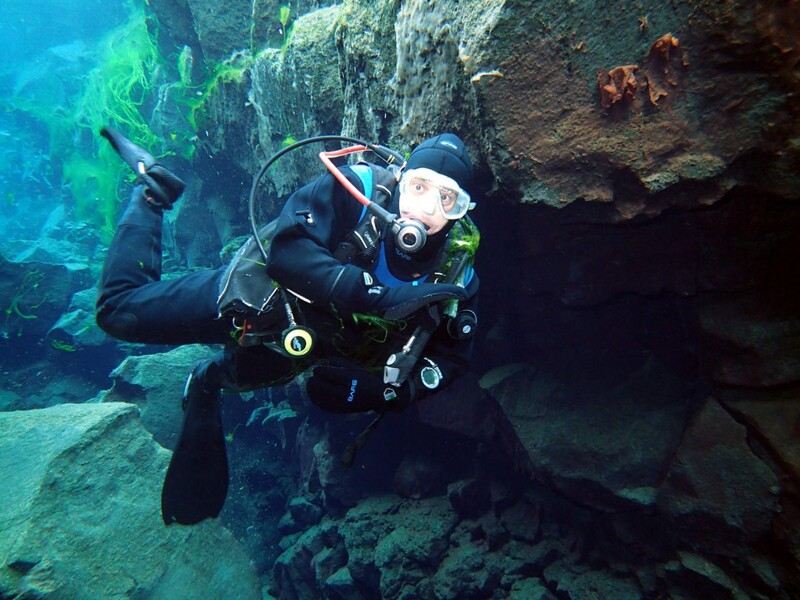 Whoever is looking for an alternative or an extension for diving in Silfra: This is the place to go. The site is located just ten minutes from Silfra and lies within the lake, where the crystal clear water from the Silfra fissure flows into it. Unfortunately, the water does not remain as clear but is a bit cloudier, depending on wind and weather. Visibility varies between dozens of meters to less than arm’s length. 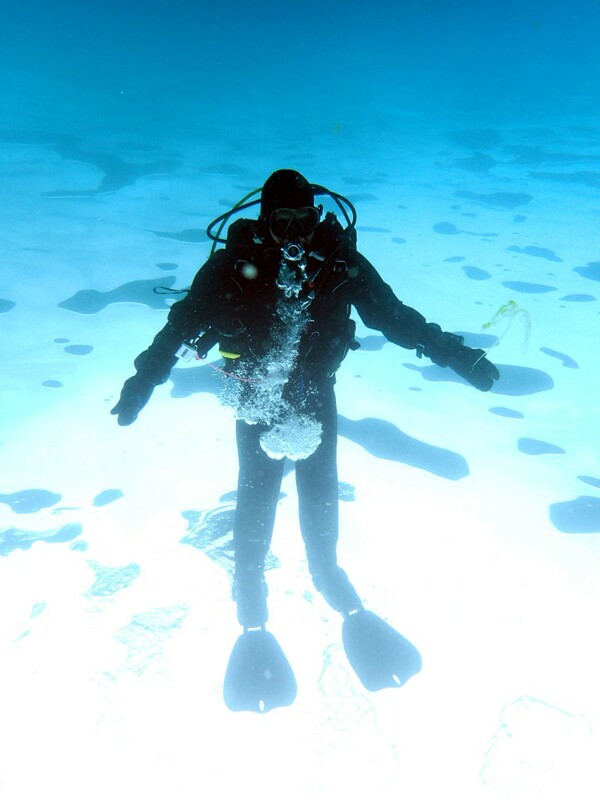 In the column itself visibility is usually excellent because the cold water here is clear on the ground and the suspended particles accumulate in the warm water over it. 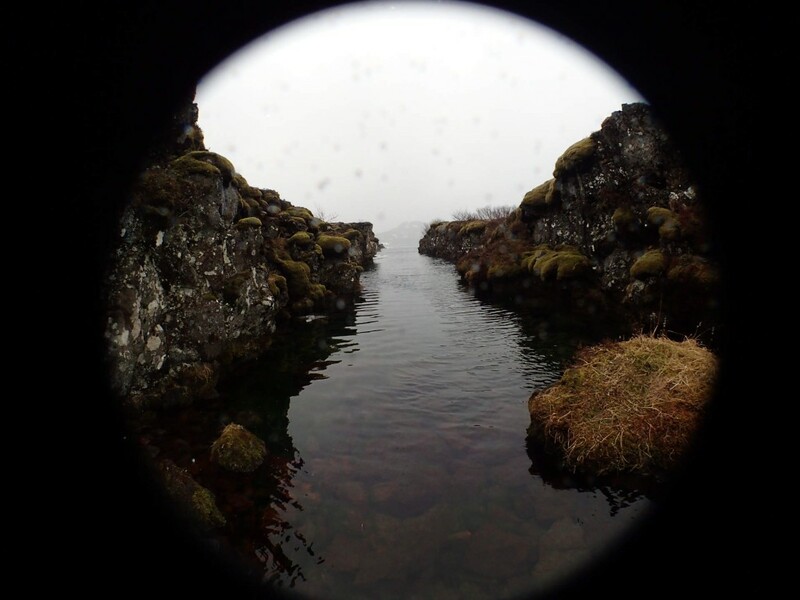 So when you arrive at the fissure within the lake, visibility is usally excellent from then on. 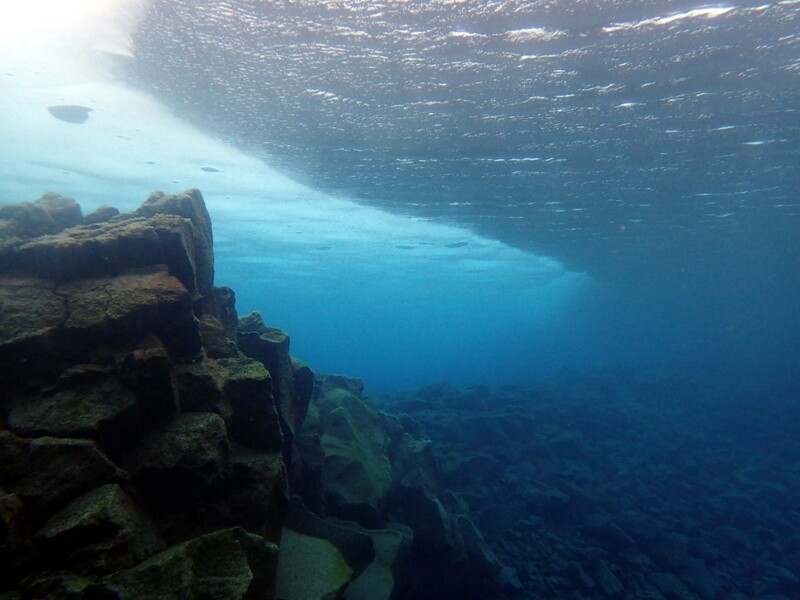 Those who already dive in Silfra will recognize similarities and important differences: The rocks here are narrower and shorter but they are colored in the same blue which can be found in Silfra. Here in Davidsgjá, the very same strcit rules to diving apply. This means: One should not dive deeper than 18m. In some places, this is not helpful because the fissure goes to a depth of more than 20m down. 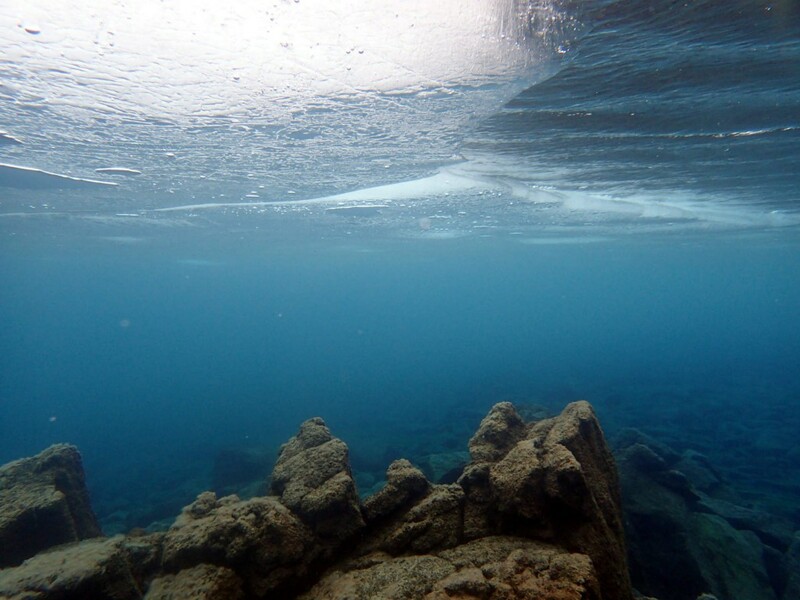 There are also some nice swim throughs which one can do here (Warning: Please always stay within your personal limits and dive within your comfort zone!). A cave system like in the National Park is not to be found here. Another difference is that of a higher probability to see something alive here. 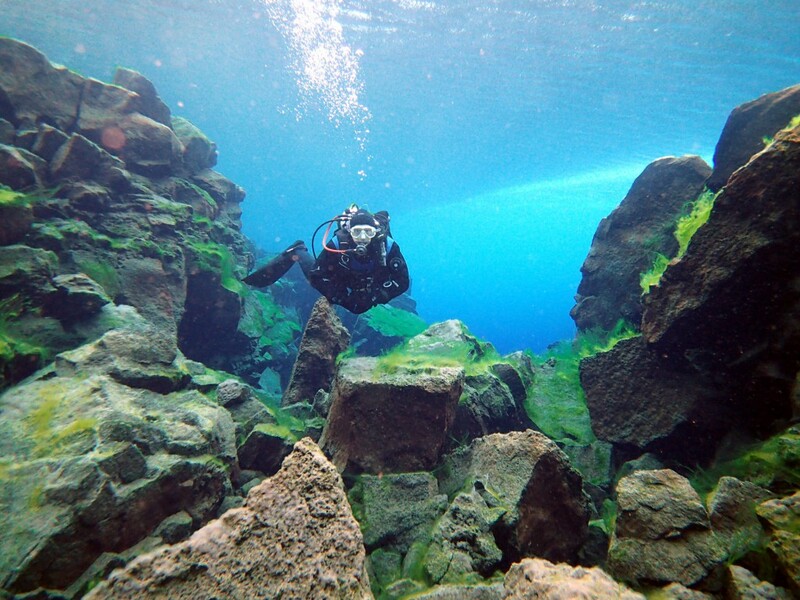 While in Silfra only a few, tiny fish appear, many types of fish are at home in Davidsgjá. One can find among others, trout and char to the length of 50cm and more. When approached quietly and calm, the fish will be happy to swim a few meters in front of or beside you. The first time I dove here was on a snowy winterday in April 2014. While the lake itself was nearly completely frozen, we were lucky that the edge of the ice was a few dozen meters away from the shore where we entered. That gave us the opportunity to safely visit the sections under the ice for some quick shenanigans. At the entrance to the dive site, perfect conditions welcome us: The water is crystal clear, many bright green algae float around and block a the view at some points. Just like in Silfra, fresh glacial water comes from the rocks into the lake all the time here. 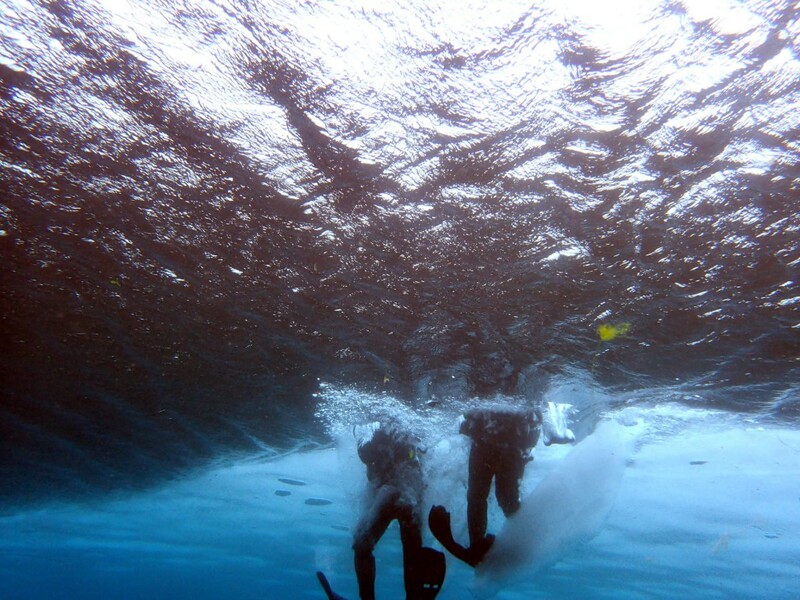 We dive in a width of approximately 20-30m and down to a depth of about 15m. Because the dive site is not visited as frequently as others, you can still sometimes find artifacts here. We find old Icelandic coins (Krona, no silver, sorry …) and an old tube of paint which must come from one of the painters who sat here years ago, painting landscape portraits from the lake with the volcano behind it. As we reach the end of the rift, we see the light blue ice and take a few pictures of us in front of this magnificent backdrop. The water temperature drops below the ice to now 1°C. Everyone is aware that we have to be careful diving only a few feet below the ice edge. Just enough to let some air in your shoes and walk on the ceiling. In the distance I can see the shadows of big trouts. A small group patrols at a safe distance from us under the ice. The animals are about half a meter long and seem huge through the diving mask. However, they remain at a distance and enjoy the tranquility. Davidsgjá is inhabited by a large number of fish, which makes it especially attractive to fishermen and so fishing lines and hooks can be found on the ground regularly. I wonder for a second if one could stand well on the ice and whether the ice edge is stable enough to heave yourself up. I’m doing the math without thinking of the 20kg equipment I carry on my back and so I give up for the time being. A little later I try it with the support of my fully inflated BCD and strong fin strokes from a depth of 2-3m and – voilà – On my stomach I slide gracefully out onto the ice. 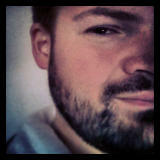 When I stand up I suddenly remember all the led in my pockets and the heavy cylinder dragging me down. 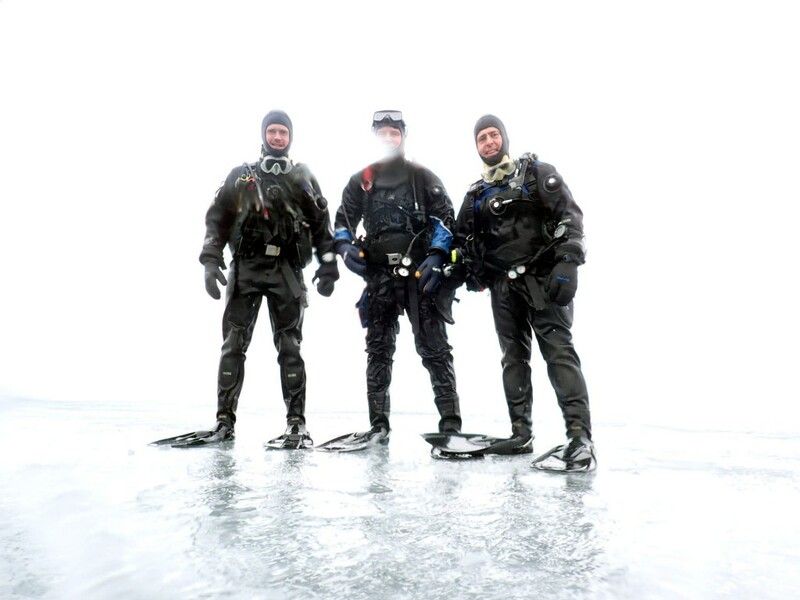 But I’m standing on the edge of the ice sheet and can enjoy the view across the lake and down to my buddies. The ice is stron enough, even around the edge so that we decide to do a giant stride into the lake. The others are of course also very interested and minutes later all slide on their bellies toward the volcano, just like sea lions in Antarctica. Three are better than one and so the layout of a triple giant stride is formulated as I dive away from the gang to quickly position myself underwater. While descending I quickly count to ten: One, two, thr… and swooosh with a loud crash, the colleagues, accompanied by large chunks of ice crash into the water and I can press the shutter button just in time. A great photo of a great dive! We slowly swim back towards the exit and still find a single trout on the road. We obviously make her feel uneasy and so she shoots back into the lake, right under us. On the way we find yet more artifacts and also a great place with a simple swim through whom we do not want to miss. 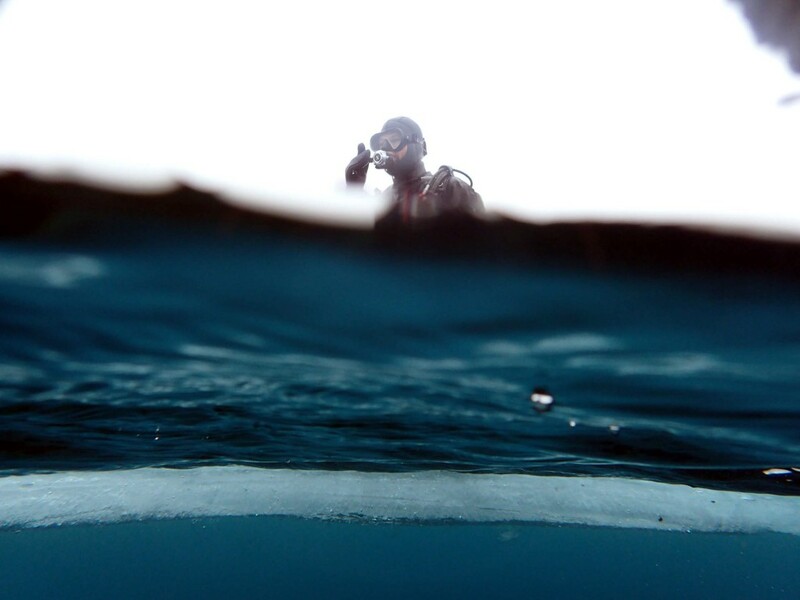 Those who want to dive at Davidsgjá should ideally contact one of the local dive centers. Everyone knows this spot and can take you there, into the lake and around in it. The entry is on a flat area with lots of flat stones and is therefore very comfortable. From there you follow a rope to the fissure, and then you can dive it north or south, the shore is always east of you. In summer, there is not much to think of. Please be cautious in terms of fishing lines and hooks. Those wishing to take the swim throughs should take a lamp and coordinate with their buddy.